One of my favorite past times is to take my dogs for walks in the park. With beautiful weather surrounding us constantly, it is the perfect way to enjoy being outside. We ventured to a park on Saturday, and to make this sweet moment even sweeter, I brought along not one, but TWO! 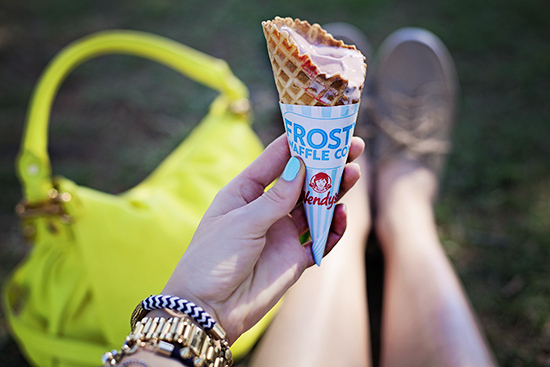 Wendy's Frosty Waffle Cones. Yes, a chocolate for myself (obvious choice), and a vanilla for my doggies. 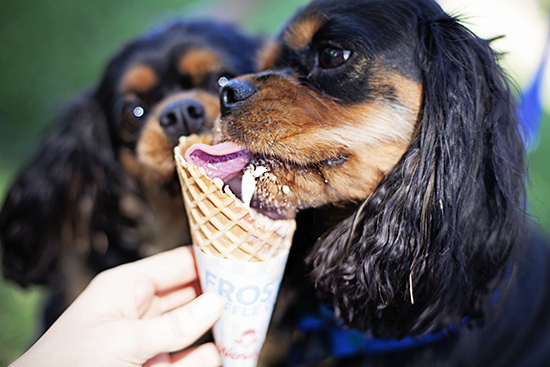 While I savored each refreshingly cool bite, Bentley and Tayla's little pink tongues were busy going a mile a minute as they inhaled every single lick. Ok, maybe mine was doing that too! A little boy carrying a pink water balloon ran up to us, laughed, and then ran away. There was just a lot of happiness going on in that park. I don't normally indulge my dogs with sweet treats, but sometimes, life should be enjoyed thoroughly for our four legged friends. And us too. As for a Wendy's frosty waffle cone? Well, that's just a staple for life's enjoyment. You're so cute Katie! :) Love your neon bag. I love your tennis shoes!! They are so cute and look very comfortable and practical!! Your dogs are soo cute!!! You made me want those sunglasses SO BAD. And some ice cream. SO BAD. I love everything about this post! And thanks for the Wendy's tip :) I will have to try it next time I'm there! What an awesome day all round! Beautiful pictures of you and your dogs. I'd love for you to stop by and check out my latest blog post. These pictures are adorable, love your dogs they are precious!!! 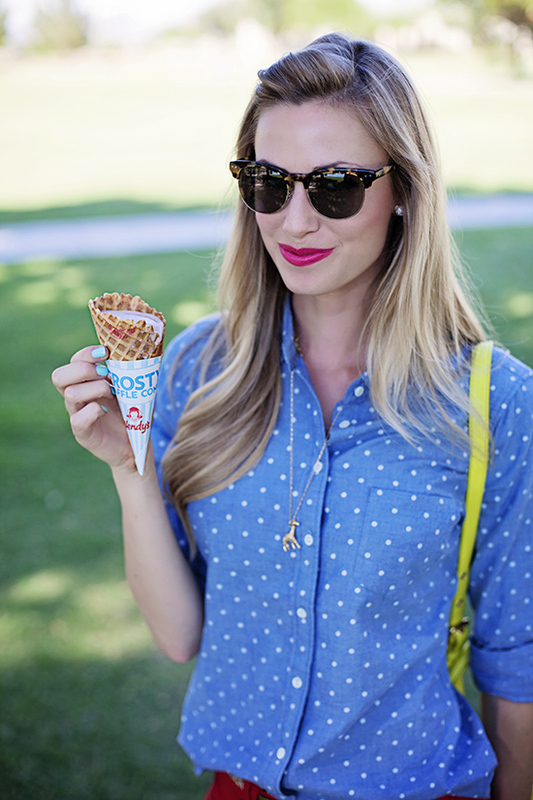 this is my kind of day...pink lipstick...ice cream cones and being outside with cute dogs :-) I found your blog via blog hopping and so glad I did...your photos are just beautiful! great combination and i really love your blouse! my dog also loves ice cream *yuummmy! Loving the polka dot shirt and the shoes. I've been considering a pair of similar shoes for a while. I am disappointed you would allow Wendy's to sponsor you like this. I am sure you don't eat Wendy's frosty wafflecones on a regular basis. If you did, you wouldn't have the body you have. You are so beautiful OMG ! You're too cute! What lipstick are you wearing? I've been looking for a good pink! 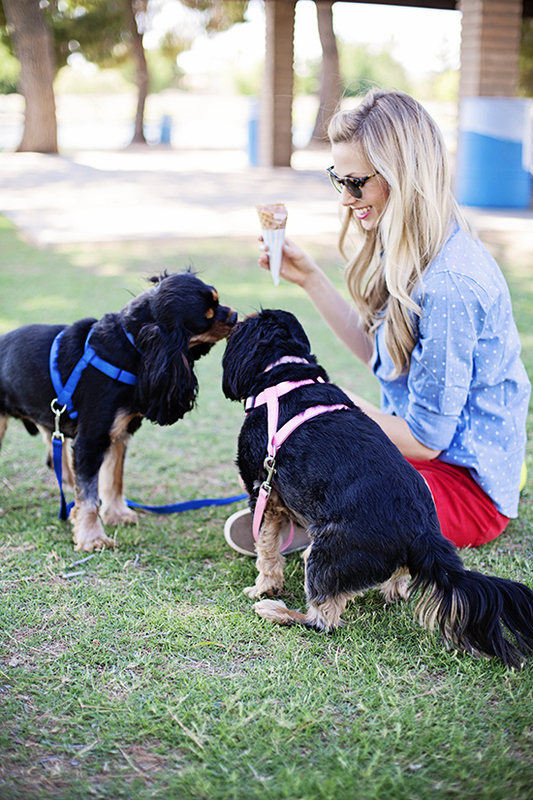 Looks like a perfect day with your pups. ok how CUTE are you!! seriously. I am loving that giraffe necklace! too cute :) loved seeing all of the event pics from ted baker, so sad I missed the one in Dallas! Yes, but very restricted. In my enjoying "World of World of warcraft," for few decades actually, I do not keep in thoughts which sub-groups damaged was due to the Buy WOW Gold container was set one's human body in . In other terms, even because this team had removed, this was not so serious or memorable. Anti-war is not because of any new weeknesses led to Cheap RS Gold place instable. In terms of the example we developed has never been "soldiers must not be scheduled for the body" as a requirement. From a PVE viewpoint, eliminate the profile limitations, this expertise is still ideal.Now let's take a look at anti-war damage problems. Great article,thank you for you share , i added this url to my bookmark , Look forward to seeing you more posts.